Hawken is committed to nurturing students’ interests and creativity while they are young. With this priority in mind, the School decided in 2017 to convert the underutilized Brown Gym on the Lyndhurst campus into an Innovation Lab, which was named after the Cathy and Larry Goldberg family in appreciation of their lead gift. This dedicated space for Lower and Middle School students allows students to move beyond cardboard and markers to the latest technologies and tools and provide them with more opportunities to explore, design solutions, build working prototypes, and solve real-world problems. In the course of the last two years, students from the Lyndhurst campus have traveled to Gates Mills to utilize the Sydell & Arnold Miller Fab Lab for special projects, and Hawken’s Director of Maker Spaces Nick DiGiorgio has taken portable equipment from Gates Mills to Lyndhurst to share with students in our Lower and Middle School divisions. 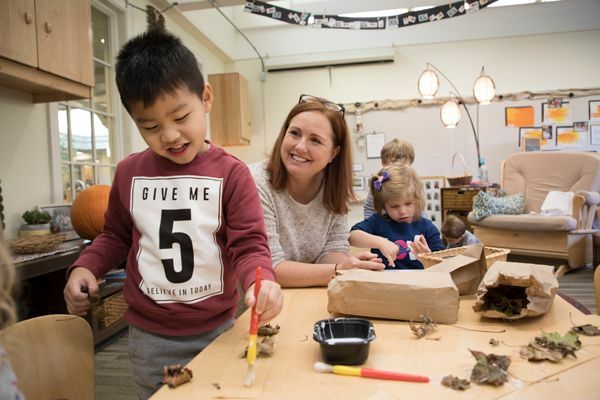 This new space houses programming for all of our preschool through eighth grade students on site, providing many more opportunities for them to create, tinker, explore, and discover using a variety of tools. The facility improvements accommodate innovative, interdisciplinary programming currently being designed by faculty members at each grade level. The 3,600 square foot, lofted Innovation Lab engages students in real-world projects that inspire students to explore their own ideas, giving them permission to create, imagine, and build. This space promotes student engagement in design, robotics, computer coding, architecture, 3-D printing, engineering, sound editing, video production, and other tangible work, enabling students to produce something novel that exists in the physical world and has utility. Students work with programs such as Arduino, Scratch and Raspberry Pi, robots, rockets, gears, circuit boards, LED lights, sensors, motors, computer-assisted drawing software, vinyl cutters, laser cutters, CNC milling machines, 3D printers, and much more. The Goldberg Family Innovation Lab features four distinctive learning areas in addition to the large central common space. This space is an enclosed project-based environment for students of all ages to actively engage in hands-on projects and collaborative STEM-based experiences. Teachers utilize the special features of this zone for science projects; wet-lab experiments; engineering challenges; and focused class discussion, experimentation, and discovery. The Fabrication Zone gives students access to hand tools, power tools, and workshop equipment to build larger projects. The Fabrication Zone invites kids to safely use the correct tools and materials to construct and build their designs. The space includes a CNC router as well as saws, drills, hammers, sanders and hand tools that you would find in a traditional woodshop. This area of the Innovation Lab allows students to transfer project ideas to the digital fabrication equipment and create 2D and 3D prototypes. Utilizing 21st century design technology, students are able to model, print, cut, and assemble using sewing machines, a vinyl cutter, laser cutters, and 3D printers. One feature of the Engineering Loft is the Collaboration Zone, which is outfitted with innovative technology and flexible furniture to enhance the collaborative project experiences. The other main feature of the loft is the Robotics Zone, where kids will get hands-on experience building and programming robots of all shapes and sizes. In the loft, students have access to the electronics station, where they can use soldering irons, programming boards, and electrical components to create electronic circuits and prototypes. The Innovation Lab at Lyndhurst aligns with Hawken’s educational philosophy that young children do best through learning by doing and playful learning. Through a variety of hands-on, developmentally appropriate learning activities, Lower and Middle School students are acquiring problem-solving strategies to think critically and creatively in order to apply and connect their solutions to the real world. Hawken teachers create an atmosphere where students feel comfortable making choices and taking risks through learning by doing. As a result, Hawken students discover the joy of life-long learning and recognize there is more than one way to come to a solution. Playful learning is also an important part of growth and development on the Lyndhurst campus. During play, our younger students, who are innately curious, are highly motivated to gain knowledge and concepts through exploration and discovery. When children play, they are making natural connections with the world as well as with others. They are also developing skills that will help them read, write, and think like a mathematician and scientist. As part of the Lower and Middle School experience, students are “making” projects that involve playing, designing, and creating. When students are engaged in this work, learning becomes self-directed and continuous. What kind of learning will my child engage in? What tools, supplies, and equipment will be in the Innovation Lab? The Innovation Lab will stock a variety of supplies for students at varying levels of readiness. Fabrication tools include scissors, saws, cutters, knives, awls, hole punches, drills, drill press, hammers, hand tools, and prototyping materials; electronic toolsinclude soldering irons, circuit materials, copper tape, batteries, and lights; the robotics area will include coding sets, snap circuits, LEGOs, iPads, and robots; and machines include sewing, embroidery, vinyl cutter, laser cutters, 3-D printers, mini CNC mill, heat press, and lab computers fit with design software. Our aim is to cultivate the spirit of open access to all students through the intentional organization of lab space and materials. “Green” supplies will be available for all student and teacher use whenever the lab is open. In addition, we will provide materials to complete advanced projects: copper, lights, batteries, specialty paints and stains, and hand and power tools for student use under teacher discretion and observation. Each project and activity in the Innovation Lab will be unique and have its own equipment and materials requirements, from paper and tape to machines and saws. Our lab director and teachers will ensure that the requirements of a given activity correlate with the students’ age and readiness. Orientation to general safety and safety equipment will be reviewed before any activity begins, and the use of any equipment will always be at the discretion of the lab director. Some areas of the lab will require the use of safety equipment (i.e. goggles); our faculty will monitor students as they enter those areas to ensure that they are appropriately and safely outfitted. When will my child use the lab? Many of our preschool through grade 8 faculty have been busy planning innovative curriculum to take advantage of this spacious, cutting-edge resource. Teachers recently received training in design and makerspace thinking and learning, and they are working to integrate this curricular model into their classrooms this year. In addition to class activities, we encourage students to use the lab on their own accord either in small groups or individually. Interested students should either contact Lab Director Anna Delia directly to arrange a mutually agreeable time or stop by during “open lab” times, which will be scheduled on a regular basis. Ultimately, we also place to supply mobile carts and tinkering spaces to support the needs of teachers and students at the Lyndhurst campus. How can I further involve my child in making at Hawken? The Innovation Lab will be available for all students on our campus in and outside of planned classroom experiences. We will host weekly “open lab” hours throughout and beyond the school day for students to drop in and work on an area of interest. These hours will be posted in the division directors’ weekly emails beginning in November. We also currently offer classes through our Passport program for students interested in learning about coding and robotics, and plan on adding additional topics in subsequent Passport sessions. Finally, we look forward to providing robust summer program opportunities for those interested in utilizing this space year-round. I (or one of my family members) have a background that could lend itself well to this type of learning. Can I get involved? We welcome an extended community presence in the lab as we work to build a maker mindset across our entire campus. We can certainly discuss activities, programs, or talks that align well with our mission, space, and student interests. Please reach out to us. I have other questions. Whom should I contact? Please feel free to reach out to Anna Delia (adeli@hawken.edu), our Innovation Lab director, Nick DiGiorgio (ndigi@hawken.edu), our director of makerspaces, or your child’s division director or advisor with any additional questions.